A 6-day safari experience starting and ending in Victoria Falls: Discover the untamed wildlife of the Hwange National Park, the friendliness of the Zimbabwean locals and spectacular sunsets that will not be forgotten. 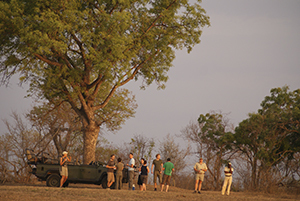 Note that this safari is available as a Driving or Fly-in safari (between Vic Falls and Hwange). Group size: Minimum 1 person. Departures: Daily, subject to availability. A small-group lodge safari, from / to Victoria Falls through Zimbabwe. 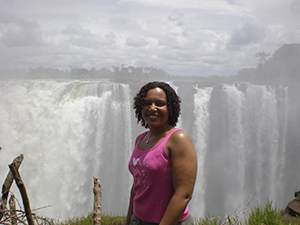 Victoria Falls, Zambezi River cruise, Tour of the Victoria Falls and Hwange National Park. 5x Breakfast, 3x Lunch, 4x Dinner. Meals included in your safari will be taken in the restaurants at the various accommodation establishments. Please advise us of any special dietary requirements in advance. Per person sharing: $1,950 per person. Per person sharing: $2,140 per person. Per person sharing: $2,550 per person. On arrival at Victoria Falls Airport you will be met and transferred to your accommodation, where you will spend the next two nights. The rest of the day will be at your leisure, to relax beside the pool or participate in in some of the optional activities available, such as a helicopter flight over the Victoria Falls. This first night you will have the pleasure of enjoying a tasteful and satisfying dinner at Ilala Lodge. 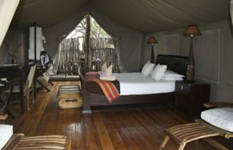 Overnight: Ilala Lodge or similar (Room with private bathroom, pool, restaurant and bar area). Overnight: Elephant’s Eye, Hwange (Chalets with open-plan bathroom, double basins and outdoor shower, private veranda, fireplace, pool, restaurant and bar area, viewing deck). Meals: Breakfast, Lunch and Dinner included. 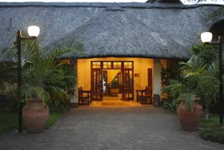 Return airport transfers; 2 nights’ accommodation at Ilala Lodge, including breakfast daily; 1 dinner at Ilala Lodge; Ra-Ikane sunset cruise on the Zambezi River (includes drinks, high tea & snacks, transfers & river usage fees); guided tour of Victoria Falls (excl. 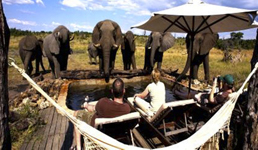 park fees); road transfer to Hwange; 3 nights’ accommodation at Elephant’s Eye, Hwange, including all meals, drinks, laundry and game activities. Flights, visa fees, optional activities, travel insurance, items of personal nature such as souvenirs, tips etc., park fees unless stipulated, meals & drinks not stipulated. The Victoria Falls & Hwange Package departs from Victoria Falls. Whilst it is our every intention to adhere to the above mentioned itinerary, there may on occasion be a necessity to make alterations in order to make the tour more enjoyable or practical. Therefore please treat the itinerary as a guide only. You will be picked up at Victoria Falls International Airport. 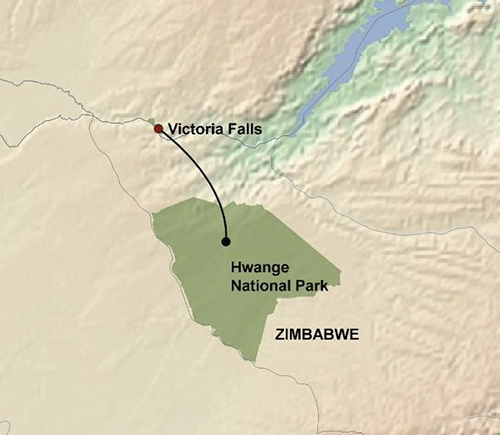 For transfers between Victoria Falls and Hwange (or vice versa), 2x4 vehicles may be utilised. All luggage, besides hand luggage and photo equipment, is carried on the vehicle or trailer roof racks to ensure maximum comfort in the vehicle. Some game drives may be conducted in open-sided safari vehicles. Airport transfers are usually conducted in sedan vehicles or minibuses. The game drives take place in open 4x4 vehicles. The onus is on the client to organize all visas required to visit Zimbabwe prior to departure. This is a country blessed with great natural beauty, game reserves and mineral wealth. The diverse landscape changes from mountainous to wilderness to typical Bushveld. The country is also home to large animals and a large bird population. Zimbabwe is a country located in the southern part of the continent of Africa, between the Victoria Falls,Zambezi River, Kariba Dam and the Limpopo river. Zimbabwe is bordered by South Africa to the south, Botswana to the west, Zambia to the north and Mozambique to the east. 'So lovely it must have been gazed upon by angels in their flight' said David Livingstone of the supreme Mosi-oa-Tunya ('The smoke that thunders'). This legendary traveler first saw the Falls from the Zambian side and his memory is enshrined in the nearby town of Livingstone. The views from the Zimbabwean & Zambian side are quite different, varying dramatically depending on the season and water flow. 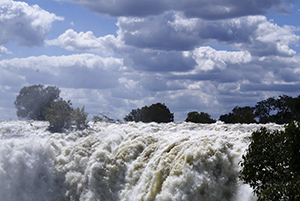 The Falls are over a mile in length and boast the largest curtain of water in the world - over 500 million litres of water per minute cascade over the falls and drop 100m at Rainbow Falls on the Zambian side. Not surprisingly is it the seventh natural wonder of the world and fast becoming one of the top adventure destinations in the world. 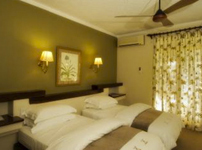 The park is situated on the main road between Bulawayo and the world famous Victoria Falls. Hwange National Park covers just over 14 600 square kilometres. 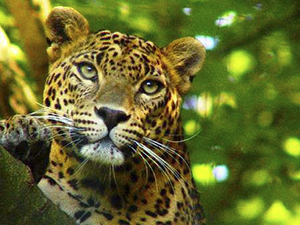 The Park carries 105 mammal species, including 19 large herbivores and eight large carnivores. Elephant make up the largest proportion of the biomass. All Zimbabwe's specially protected animals are to be found in Hwange and it is the only protected area where gemsbok and brown hyena occur in reasonable numbers. 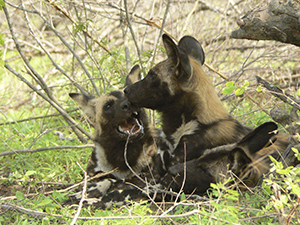 The population of wild dog to be found in Hwange is thought to be of one of the largest surviving groups in Africa today. The landscape includes desert sand to sparse woodland as well as grasslands and granite outcrops. Due to the lack of water, man-made waterholes were introduced to sustain the animals through the dry season. The park has an interesting variety of landscapes with one part running alongside the North-eastern end of the Kalahari Desert. The south is sandy with extensive forests and open grassland. A feature of the area is ancient fossil dunes - ancient sand dunes held together by vegetation.